I love it when things go as planned and there are no dramas. 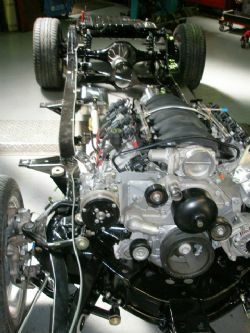 Following on from the last article the build is continuing and the 1957 chassis is being populated with the goodies to make it perform and handle like a modern car. The guys at Quickfit will have it for another week then we turn the page and start the next chapter. All the drive train updates will be completed and installed by next Thursday and then Project Nomad will be off to Joscar for the final panel massage, paint and build. The last week has seen a lot of the stuff I have purchased over a period of time installed and a number of fabricated pieces coming together to complete the overall chassis build. 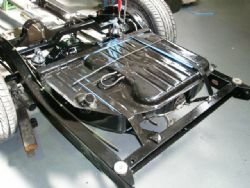 The petrol tank has been fitted and the lines have been run along the chassis rails. The pipes have been bent and cut for the petrol filler cap hidden behind the left hand rear chrome trim and this will feed directly into the eighty litre tank lifted from a Holden Statesman. Tony installed an updated fuel pump in the tank that does away with the need to have another in line filter and external pump and this also helps keep things simple and clean. The brake lines have been run along the chassis and the old brass knuckles from the original lines have been reused in the new set up. Early next week the body will be reacquainted with the chassis and the brakes will be bled and tied into the master cylinder. The stainless exhaust has been installed and I took up the rear bar and brackets to measure where the exhaust tips will come out before the body is dropped. 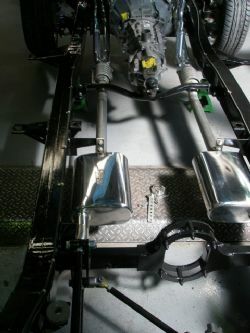 Custom fabricated exhaust hangers have been welded to the chassis and the pipes will run under the rear axle allowing flexibility for any changes in the four link height adjustment or coil over set up. All the associated bits with the engine and transmission have been sorted. You always need to be aware when you get something that touts “all you need” for whatever the purpose expect that you will need a lot more. 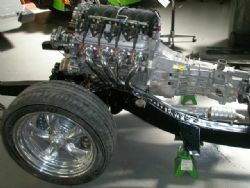 Buying the LS2 and the six speed transmission the marketing boys had pitched it as a complete solution for a modern drive train in a classic muscle car. It did come with a starter, wiring harness, computer and alternator but there is a gamut of other stuff needed. Re programming the computer, transmission backing plate, throw out bearing, engine mounts, manual flywheel, clutch, clutch slave cylinder and lines, made to measure driveshaft and valve covers come to mind straight away and I’m sure after this third glass of Pinot Gris there are plenty of others I have forgotten. The moral of the story is a common one – do your homework and buyer beware.